Sometimes, sweetness strikes you when you least expect it. As most of you undoubtedly know by now, I held a quilt contest; the person who had the closest guess to Jeff's raw hospital bill at UAB won a quilt. Susanna, a co-worker of mine, won it by guessing $550,000, getting her just a little over $7K away from the true number. I fully expected to be constructing a new quilt for her, but she asked if she could have an antique, instead. 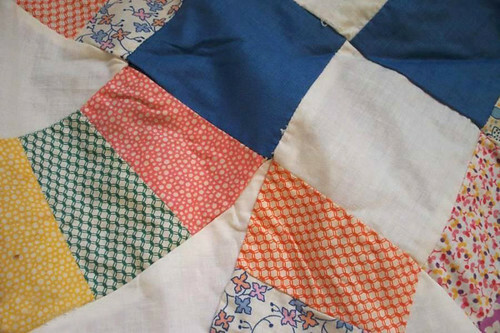 She said that she'd never gotten a quilt when she married, and that her tenth anniversary was coming up this summer, so why not make it a real antique? 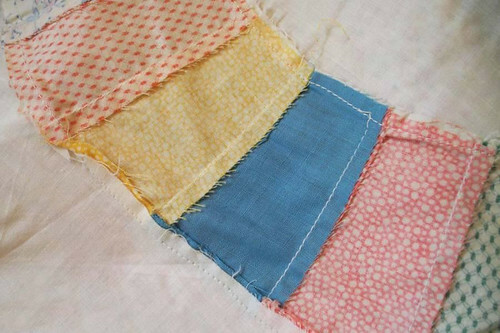 She loved Depression-era quilts, and quickly settled on a Depression-era double wedding ring quilt, preferably with feedsack fabrics. I went on the hunt. 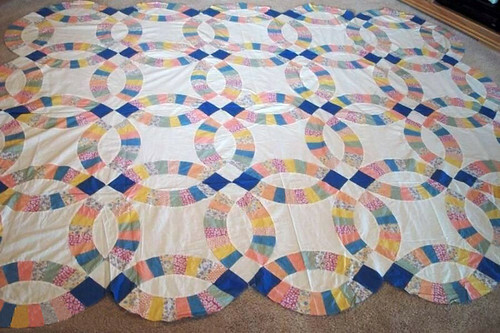 I missed out on a few quilt tops that I liked, and finally settled on one that had good construction and color choice, met all her parameters, and was in excellent condition. Total cost, after shipping, for what I've affectionately called the Half Million Dollar Quilt? $56. I asked Susanna what she wanted to name the quilt, and she responded without hesitation, "Bessie Jane!" Bessie Jane it is, then! I am not able to tell you very much about the quilt. I purchased it at an estate sale for Naomi Payne in Yreka, California. She lived on Payne Street, named after her family, long-time residents. No one at the sale knew if she made it herself or where it came from. There was a sewing machine at her home, so she probably did make it. Naomi was born in Idaho to Myrtle and Ollie Spurlock on July 20, 1914. The family moved to Kelso, Washington and then on to Yreka. Naomi graduated from Yreka High School and went to work at the Broadway Theater as an usher and cashier. She met and married LaRue Payne in 1937. Instead of a traditional church wedding, they were married in The Broadway Theater during the intermission of the movie "Time Out for Romance". Many people here in Yreka remember attending their wedding because it was an added attraction for the theater goers. Naomi and LaRue were very active in the Siskiyou County Sheriff's Posse, the Trail Riders, Greenhorn Grange and in raising and showing horses. They loved to go dancing and did so whenever possible. Naomi loved animals and always had numerous dogs, cats, and horses. She was a talented china painter and ceramist. She was a devoted mother, wife, and homemaker. Naomi was predeceased by her husband LaRue in 1997 just days short of their 60th wedding anniversary. She was also predeceased by her parents, two brothers, Delbert Spurlock and Donald Spurlock and her niece, Gayle Spurlock Turner. She leaves her daughter, Jean Payne Gibbons and her husband John of Yreka. two grandsons, Michael Gibbons of Sacramento and Sean Gibbons and his wife Dena of Weed. Three great grandchildren, and a nephew, Greg Spurlock of Longview, Washington and his mother Earlene Logan of Yreka. At her request, no services will be held. Any remembrances may be donated to the charity of one's choice. It's not an airtight provenance. We can't assume that Naomi made the quilt top, but it's a good assumption. She would have married at about age 23, sometime in 1937, right at the end of the Depression. World War II would begin a couple of years later. Feedsack fabrics, common at this time and for some years forward, would almost certainly have been available to her. Her age and the fabrics' appearance mesh well. No proof that she was the seamstress, but good circumstantial evidence. Naomi died just a couple of months ago, just shy of her 97th birthday. and the joins are neat and clean. I expect to get my hands on it next week, and have every intention of doing a traditional quilting pattern on it. 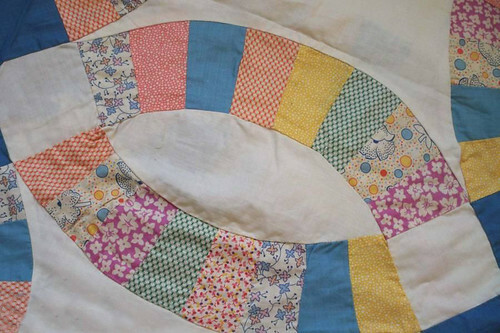 First, I will echo quilt the rings -- meaning, run quilting lines 1/4" inside and outside each ring. 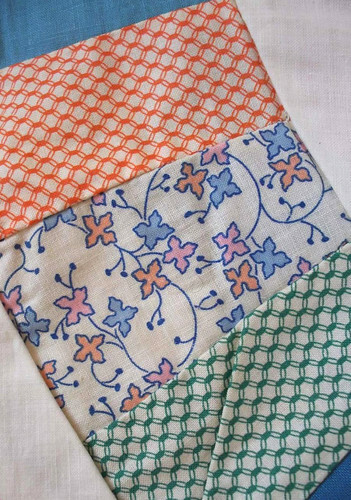 (This provides all-over stability and emphasizes the curved designs of the quilt while keeping you out of the extra bulk of the 1/4" seam allowances.) 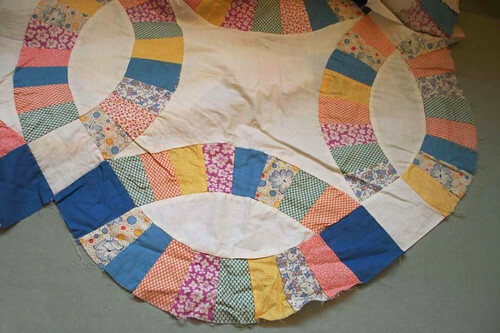 After that, I can bind the quilt to stabilize it further, and then I'll need to decide what quilting motif to put inside the white center area of each ring. It will be finished with love and care, and go on to its next life with someone who will use it and retell what little of its story we know. I'm tickled to have such detail on the person who probably made the quilt top; you can tell just by looking that this quilt top has years behind it, but most of the time, we never get to know anything about those years. This time, though, we do. Brilliant! really brilliant, I am just so excited. Thank you Amy, I am so lucky to have gotten to work with you and friended you.